The RMS Titanic was the very epitome of luxury. Every aspect of the ocean liner was extravagant, so it’s only fitting that at the time of its release in 1997, James Cameron’s Titanic was the most expensive film ever made. The 1990’s saw the full-scale return of epic films, a once-thriving genre that had largely faded into memory. Seven of the ten Best Picture winners from 1990 to 1999 can safely be labeled as epics, and five of them have running times of three hours or more. Still, no one thought that a blockbuster could be epic in length and still garner the repeat viewings necessary to cover the film’s large budget. With the arrival of Titanic, it was official: the epic was back. This film proved that modern audiences were, in fact, still capable of sitting in a theater for three hours at a time. It proved that film studios could spend $200 million dollars (more than most films ever make), and see revenues of nearly two billion. Years later, paying Titanic another visit, I am pleased (though not surprised) to find that the film has lost none of its potency. Now that the hype has died down and the dust has settled, Titanic is currently passing its final test with flying colors: the test of time. After all, the film is composed almost entirely of timeless elements, appealing to nearly every age group within nearly every culture. 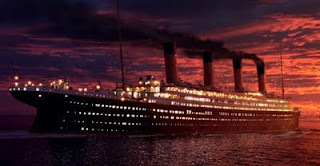 Titanic succeeds as a period piece, a drama, an action film, and a romance. The core themes are true love, class struggles, teenage angst, and death. These same terms could be used to describe half of William Shakespeare’s plays. Rather than Verona, Italy, the story is set in 1912 on the maiden voyage of the RMS Titanic. The story follows Jack Dawson (Leonardo DiCaprio) and Rose DeWitt Bukater (Kate Winslet), two young lovers who come from completely opposite backgrounds. Rose is a first-class passenger on her way to America to marry a steel-tycoon, whereas Jack won his third-class ticket in a last-minute poker game. They find one another onboard the ship, quickly fall in love, and struggle to overcome the restraints of the class system (a feat which makes surviving the shipwreck seem easy). Rose’s fiancé, Caledon Hockley (Billy Zane), is an arrogant, wealthy man who will do anything to come out ahead. Rose consistently enjoys seeing him fail. Conflicts emerge. The second half of the film chronicles the physical and emotional struggles of all passengers as the ill-fated ocean-liner slowly disappears beneath the surface of the Atlantic. A large part of the film’s brilliance and success lies in its length. So many films have no sense of order or purpose in their running times, but Titanic knows exactly what is required for it to work. In order to maximize the potential of both halves of the film, Titanic isn’t afraid to take its time: 197 minutes, to be exact. The film has plenty of sweeping, breathtaking scenes, but also remembers the little, “unnecessary” moments that make both the characters and the environment more real. Once the ship hits the iceberg and characters begin struggling for their survival, James Cameron brilliantly shows how the class system was upheld, even in death. Passengers were cared for according to their “worth”, and it wasn’t until the very end that class structures began falling apart. These are some of the film’s best scenes, including a moment where a crew member throws a handful of money back in Cal’s face, telling him, “Your money can’t save you any more than it can save me.” Because so much time has been spent with these characters already, seeing them make decisions under pressure is all the more rewarding. Another phenomenal achievement of the film comes with the characterization of two inanimate elements: the ship and the ocean. Cameron crafted a screenplay that very cleverly showcases the ship itself, and therefore shows off the film’s grand sets. Characters move all over the decks, the rooms, the storage compartments, the boilers, and even the engine rooms, where we see huge machinery at work. The boat itself is so detailed, so convincing, that the audience is caught up immediately. Like other aspects of the film, the historical detail works on both large and small scales. There are moments where the camera moves up close and shows ornate carvings in the furniture, while other shots sweep across the 900 ft. length of the ship and steal our breath away. As for the ocean, once the ship begins to flood, Cameron takes what was beautiful just an hour earlier and makes it seem alive and menacing. Crawling down hallways, slowly choking the life out of the ship, the ocean itself becomes a character, and Cameron captures the suspense in near Hitchcockian fashion. Once again, time is on the film’s side. When the shipbuilder, Mr. Andrews, tells the captain that the ship will sink in “an hour ... two, at most,” we watch the ship go down in almost real time. No shorter time frame could have so effectively captured the horror and madness of being aboard a sinking ship. The romance between the two leads strikes just the right note. It’s asking a lot of some viewers to accept that two people could meet and fall in love in just a few days, but that’s fairly typical of classic romances. Kate Winslet and Leonardo DiCaprio have wonderful chemistry, breathing real life into potentially stale dialogue. The material is largely melodramatic, and here we reach the arguing point where so many critics rebuke the film most harshly, and yet it is on these very grounds that I will defend Titanic most passionately. Art criticism abounds with elitism of all kinds, and far too many film critics believe that in order to be film experts, they mustn’t see films for what they really are. In everyday life, these are the people who reject anything that becomes overly popular, believing that only obscure masterpieces can have real value. I reject this attitude. Art must be discussed on its own terms, and Titanic remains a remarkable achievement in the genre of epic films. To all who claim that melodrama can't hold real power or weight, I would inquire if these viewers have seen Gone With the Wind, or the other two films tied with Titanic for the most Academy Award wins: Ben-Hur and The Lord of the Rings. No, I'm not claiming that all these films are the same, or that they are even attempting to convey the same themes. What I am saying is that melodrama has the power to reveal deep human truths; this was true in Shakespeare's time, it was true in the golden age of Hollywood, and it's just as true today. If so many melodramatic epics hold records and are beloved by countless viewers, then the power of epic melodrama to deeply affect us should not be questioned. Millions of viewers around the world connected with Titanic, and viewers will continue to do so for as long as movies endure.